Thought this was a windup....£1900? Does it shave any better than the other Genesis OB's? 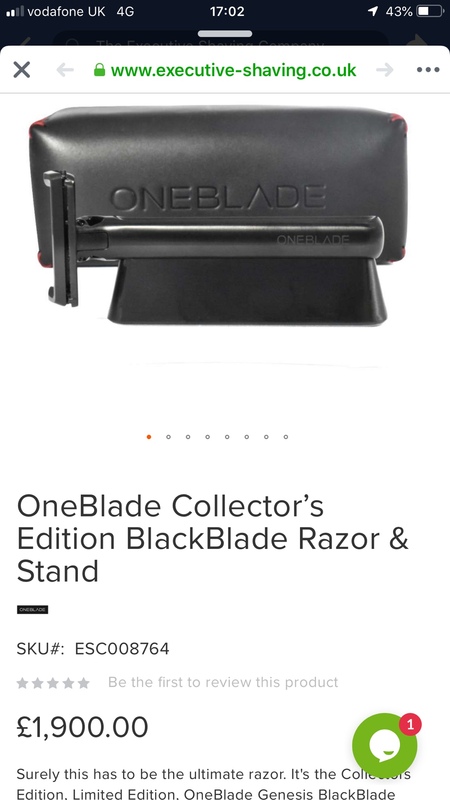 Am I alone in never really liking the Look of the One Blade , also understand that the blade it uses is not that wonderful.Mind you if I believed the blurb, the price also is a bit off putting.would put my PAL Injecto Matic up against it any day and under £25. The OB I consider to be an efficient razor that needs no technique to accomplish a BBs for people who have recently turned away from carts. Once a decent technique is mastered, there are other more satisfying razors to use, also way less expensive. I have 2 Genesis V1 which I rarely use.